1 negative : b&w. ; ; 120 mm. Published in Rafu Shimpo, January 30, 1970, Japanese section. Mr. Takashi Hoga, producer of the Chambara motion picture Hitokiri, interviews Japanese actress Izumi Yukimura as two smiling men look on at Kawafuku restaurant in Little Tokyo, Los Angeles, California, January 29, 1970. 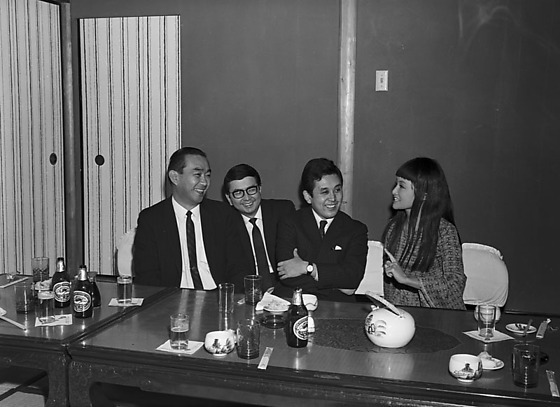 Three Japanese men in suits sit a low table on floor smiling at woman with bangs and long hair at right. They are identified (left to right): Tom Saeki, representative of Nihon Hoso in Los Angeles; special correspondent Motoyuki Ariizumi; Hoga, Fuji Television producer; and Yukimura. Beer bottles, cups and tea pot on table. Typed on original envelope: Hoga Takamine and Izumi - Producer of Hitakiri -- at Kawafuku Restaurant.